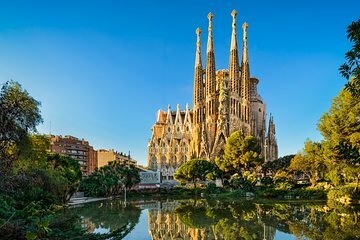 Skip the long ticket lines to Basilica of Sagrada Familia and other fantastical structures of Antoni Gaudí on this small-group guided tour in Barcelona. You’ll benefit from fast-track entry and an intimate tour of the famed Spanish architect’s most iconic works, including Park Güell and the UNESCO-listed apartment building La Pedrera. Stroll around the Gothic Quarter and relax with a light breakfast plus lunch (Iberico ham paired with wine). The unique modernist works of architect Antoni Gaudí help define Barcelona's contemporary urban landscape. Your full-day city discovery tour begins at a central meeting point in Plaça de Catalunya, where you'll connect with your knowledgeable local guide. Explore the architecture of the famed Gothic Quarter on a morning walking tour. Discover Barcelona Cathedral and cross the Jewish Quarter as you head to Placa de Sant Jaume. From here, ascend to the terrace of Montjuïc park, a hilltop cultural complex boasting great views of the city center and a rich history as the site of the 1929 International Exposition and the 1992 Olympic Games. Next, experience Gaudí's most iconic work, the spectacular, dreamlike La Sagrada Familia Basilica. Admire the eye-popping Gothic exterior, and skip the long entrance lines to wander below the many interior arches and learn about the rich symbolism incorporated into its design. Afterward, explore the surrounding neighborhood including Plaça Sant Jaume, home to City Hall. For some of the best views in the city, head into the Gaudí-designed Park Güell, with skip-the-line admission, a fantastical public terrace featuring colorful mosaics, undulating structures and panoramic views over Barcelona and the sea. Learn about the history of the park and its many secrets as you visit the most interesting corners with your guide. 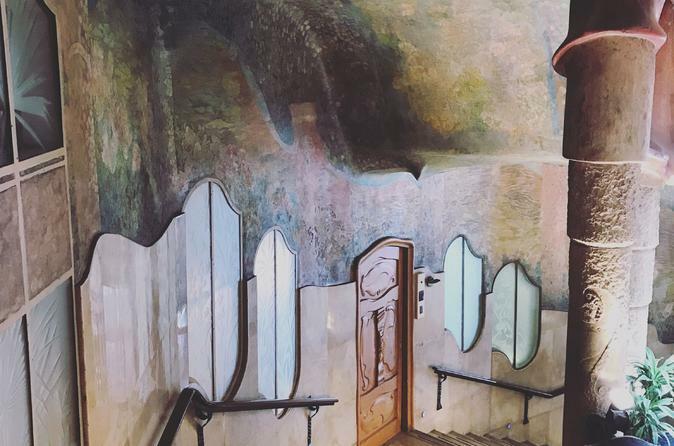 Then, enjoy a skip-the-line visit to one of the most famous apartments in Spain, Gaudí’s Casa Milà, also known as La Pedrera. Head up to the rooftop terrace and see one of the original apartment residences preserved much as it was during the building’s construction in the early 20th century. Our tour guide Joseph was knowledgeable friendly and accommodating. I would recommend this tour to first time visitors to Barcelona as there's lots to see. Our tour guide was more informative than the audio guide at some of the locations. Included in the tour was light breakfast coffee and croissant, lunch very expensive Iberico ham sandwich and wine, they also provided water. Our guide was Amazing and very informative. This tour will be worth it! The sights were incredible and magnificent to behold! Our guide Joseph was so knowledgeable and so enthusiastic and personable. We learned so much history and facts about each place we visited. The whole experience gave us memories we will look back on anytime Barcelona is mentioned. Our tour guide, Joseph, was fantastic. He was so enthusiastic about everything Barcelona. His knowledge was extensive and we all enjoyed learning about Catalonia, Gaudi and Barcelona's past to present history. We had a great tour with Laura, she was awesome and made it an interesting tour. The day was well planned and there was never a dull moment. Fast paced tour with nice intermissions to relax morning coffee, lunch, and on the bus. Joseph is an amazing guide. Full of energy and heart. He speaks great English and has a ton of knowledge of anything Catalonian. Gave solid tips on photo ops. We were in a group of 6, loved the personalization and the attentiveness we received. Food choices were delicious and all inclusive. Joseph also gave a list of great recommendations on what to do and eat for the rest of our stay in Barcelona. There were bottled water on the bus. Driver was also courteous and careful at driving. With the blessing of the beautiful weather, it was a perfect day and experience. Well worth the money and time. Joseph was incredible! He's super knowledgeable and amazingly passionate about the history and culture of Barcelona. The guide was knowledgeable and interested in his clients. This tour was really two tours. More time in all locations would have been better particularly Park Guell, although would make the day longer. The introduction to cava and how it is made was great. We had an incredible day in Barcelona with our guide, Joseph. He was very knowledgeable and the passion for his city and its culture was palpable - he will bring the energy! Sagrada Familia was amazing as well as Park Guell and LaPedrera. We also were shown many other sites including the Gothic and Jewish Quarters, Cathedral of Barcelona, Santa Maria del Mar, the Olympic Village, and others. Joseph shared the incredible history of Barcelona intertwining it with Gaudi's life and his impact on the city's architecture and style, with an emphasis on Gaudi's incredible attention to detail. A great day that left us wanting more! Highly recommended.